Along Sydney’s Cockle Bay Wharf tourists and locals are spoilt when it comes to waterside eating. 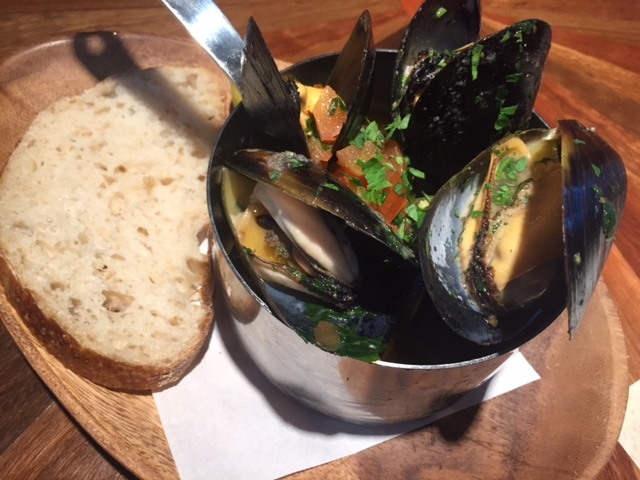 Confronted with lots of choice too often special offers on blackboard menus or sheer convenience will tempt diners. These same diners unwittingly end up in a restaurant with no real identity. So, like at any tourist hot-spot, it becomes the more important to feast wisely. 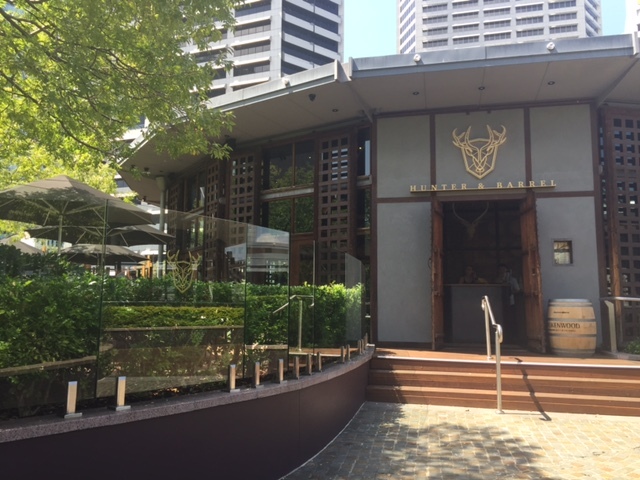 This is where Hunter and Barrel comes in – although part of Cockle Bay it’s absolutely clear on what it stands for and it’s a restaurant that certainly isn’t trying to be all things to all people. The focus is meat and more meat. So why the Hunter? It’s a twist on our ancestor’s way of preparing food – with slow cooked meats, stews and sides prepared by a coal and spit rotisserie. Of course there’s no hunting or gathering involved – that hard work has been done. But in the open kitchen quality meats and seasonal produce are cooked amongst natural elements of wood and coal. It’s all very masculine and confident and plays right into the paleo way. And the Barrel? The beverage selection goes way beyond a standard cocktail, beer and wine list with drinks inspired by the barrel. 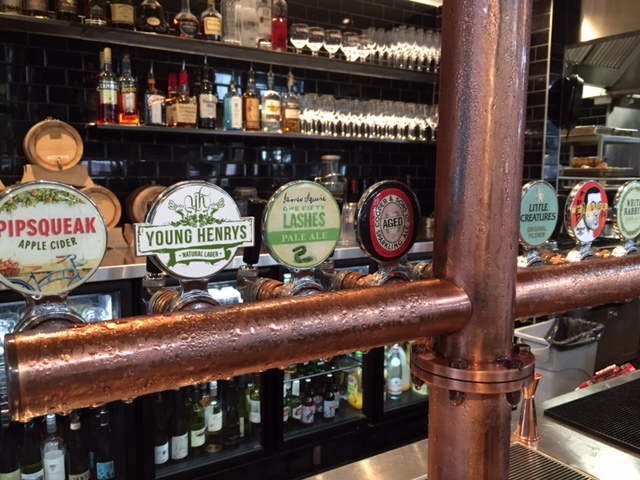 Like barrel aged cocktails and spirits, and Hunter Valley wines from Brokenwood served ‘from the pipes’. The beer list has been given just as much thought too with a solid selection of craft beers on tap. Back to the food. 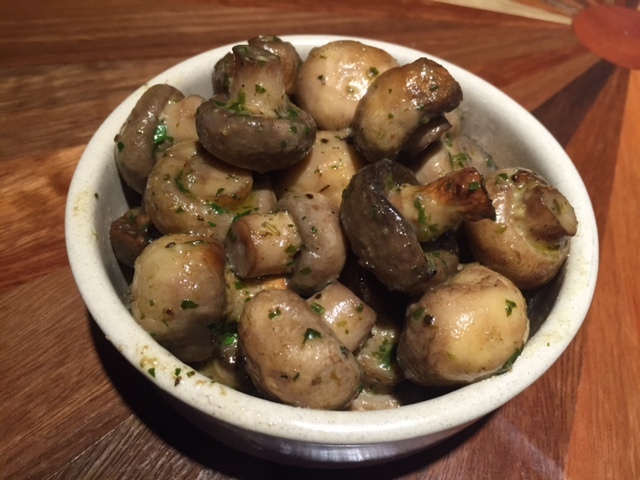 If you indulge in nibbles or starters then perhaps try a non-meat option – knowing a meat feast is where you’ll likely end up for main course. 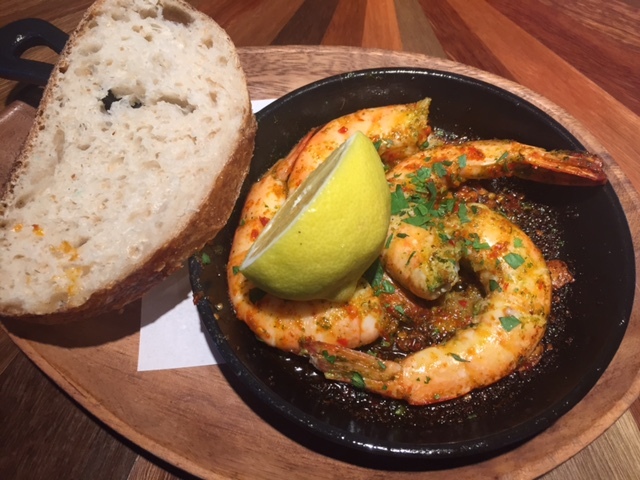 The prawns and mussels are hearty fish options that both come with toasted sourdough bread (sourdough that’s been especially chosen for being lovingly made with a single origin grain). When it comes to the wide choice of meaty main courses the menu has sections ‘from the coals’ and ‘from the skewers’. All dishes come with a choice of salad or side. 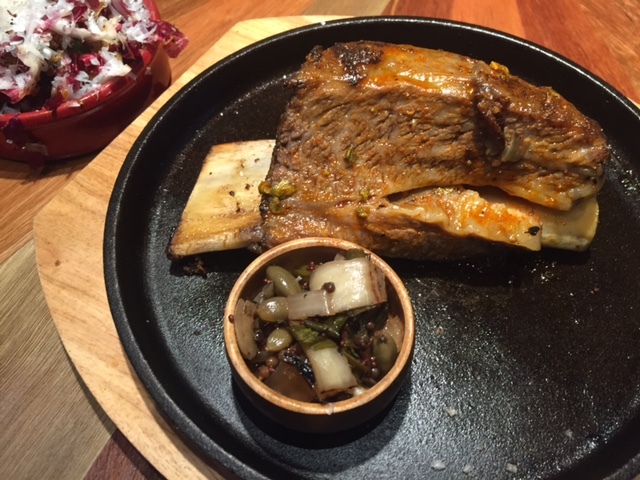 The slow roasted beef rib from the coals comes tender and juicy and makes a nice change from choosing a more conventional or premium cut. 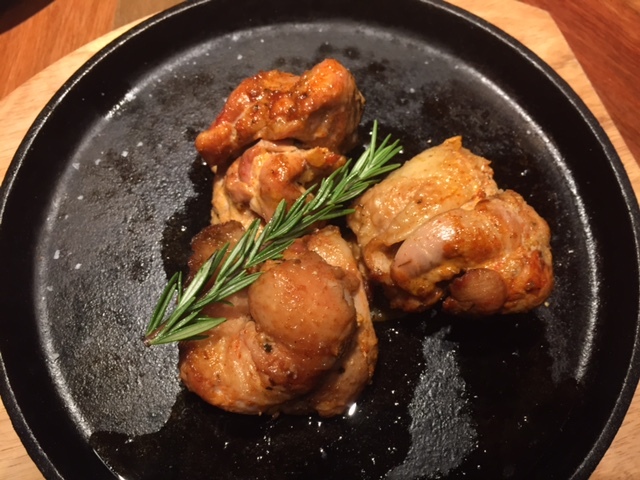 From the skewers you can’t go past the chicken thigh – which like many items on the menu is a steal at $22 with a salad or side included. Of course not everyone can manage more than a palm sized piece of meat – and this is where the solid range of sides comes in. 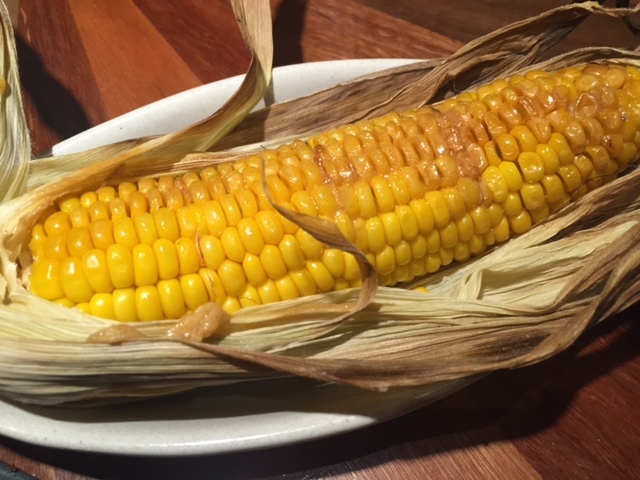 Like the roasted corn that seems to be on every table – it comes served in the husk and is cut into small individual pieces so you don’t have to eat it looking too hunter/gatherer like. In a group or extra hungry? Larger parties and hungry bellies are well catered for with special Feast menus. 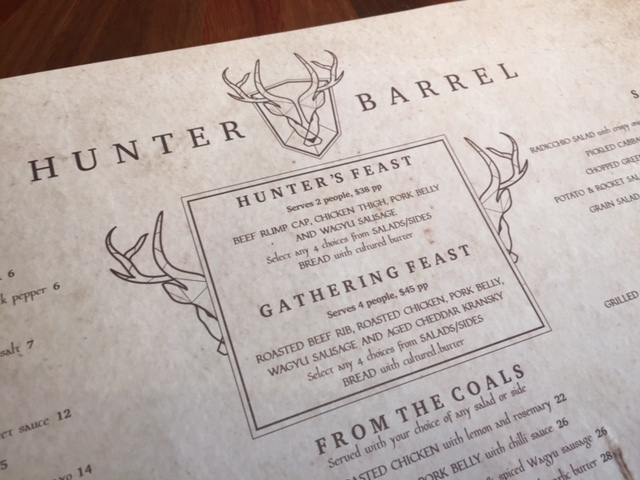 The Hunter’s Feast serves a minimum two at $38 and the Gathering Feast a minimum of four at $45 each. Both come with tasters of beef, chicken, pork and more plus salads and side options. Dessert isn’t included but with 4 tempting desserts all priced at $10 it’s very tempting to balance out the meat feast with something sweet. Vegetarian? Of course a drawback of Hunter & Barrel is that vegetarians are far from foodie heaven. The veggie burger feels like a token gesture and the salads and sides aren’t really hero dishes for vegetarians. But as I said at the start – they’re not trying to be all things to all people. 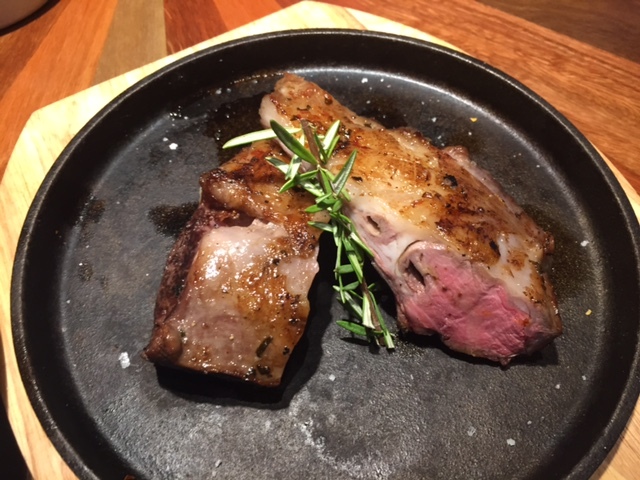 So if you sit firmly in the meat camp and happen to be in the area don’t waste time deliberating in the face of choice – dive in for a meat feast. 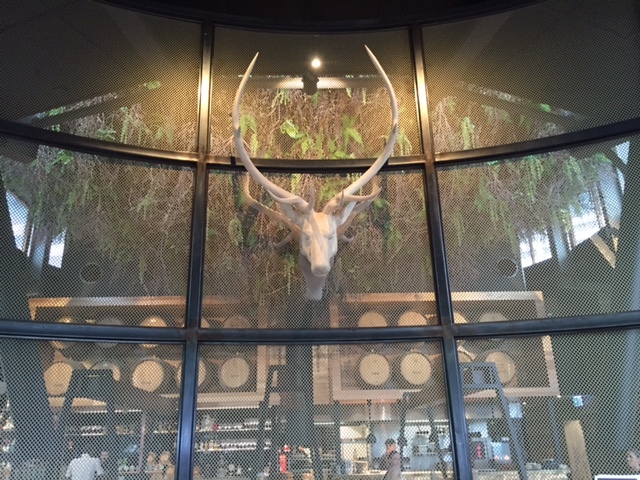 I dined thanks to an invitation from Hunter & Barrel. 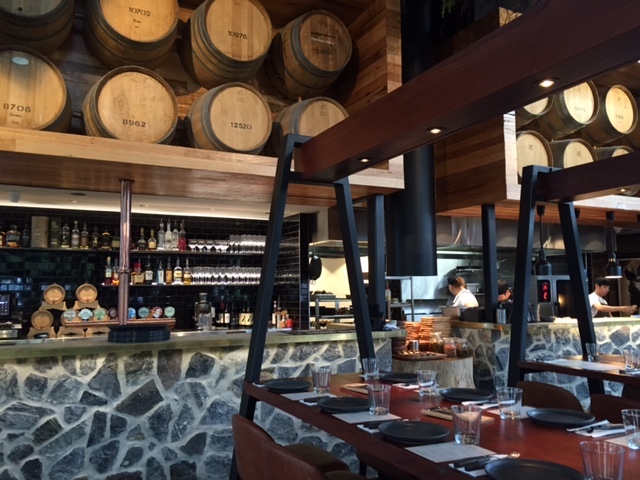 Tags: Darling Harbour, Hunter and Barrel, review, Sydney. Bookmark the permalink. Thanks Nell – I guess that means you like a good meaty-feast!